Agree on the bracing!! A local tip: Biltema sell 5 kilo sacks of beech paint stirring sticks... perfect for solid bracing! Why not swap the double door for the leftmost window? Should give better spacing. One thing to note on Bob's station: The tower and 2nd story are both at the same level. Your second drawing also has this property. I have seen it both ways, but NOT in factories. At least in the US, the usual use for a tower in a factory was to hold stairs to move from one floor to another. Often the tower would have very large windows or doors along with a crane at the top. This would be used to hoist machinery onto each floor. I have never seen this kit before but one certainly can think so as my drawing looks very similar. Hi H�kan, Thank you for kind remarks. Wait tell you see her restored. I did NOT think for a moment that you borrowed from me. The Mansard roof was a very popular Victorian design used on everything from Humble (relatively) cottages to large factories and I certainly don't own a copyright to the style. While your design is similar to my station there are several differences that mark yours as a unique and independent design. One I'm looking forward to seeing you build. I have emailed you the SS Ltd plans and something even rarer for SS Ltd. kits, their limited instructions which I hope will give you more insight of how to build the roof. Dave's comments on the Tower being the stairwell is spot on. I have not been in a factory of this design but I once was able to tour a home. In that home the stairs cut right across the Windows. One more thing. The windows you showed in photo 5529/9129183780_e69eefd3b3_z.jpg (the one with the smaller windows in the tower)are very appropriate for this building. Some photos for inspiration: http://mass.historicbuildingsct.com/?tag=mansard See the second image for the factory tower. On factory buildings, it was common for the tower to have a fancy Mansard roof where the factory itself had a more conventional roof. On commercial/city buildings, a Mansard roof on the main structure was more common. Thanks for the tip Dave and Troels! Troels I just remembered that I had such a Biltema bag in the basement at the summer house and now I'm home, but I'm sure I have something to substitute. And thanks for the idea to swap the double door with the window. Many thanks Dave(Emery) and Bob for the information! Most helpful all of it! And thanks Bob for the drawings. Bob, I think we misunderstood each other. I just meant that I have not before seen the SS ltd kit even on ebay and that my drawing came out looking a little similar. The tower will house the stairway then. Its a little to wide for the stairway but I still think I'll keep the width as I think it looks good. The offices has moved to the part of the building that continues into my background . 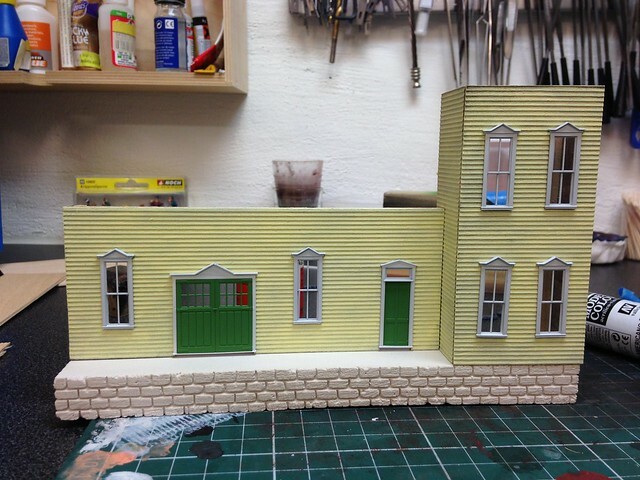 (This is the old Classic Miniatures "Leadville House" done in brick.) Post-it notes make great blinds, by the way, and even though they fade, the faded color looks pretty good, too. The new idea then now is to add second building as an office. On the factory I still have to keep the mansard roof on the main building as I have no space for a conventional roof and I don't want to turn it 90deg so one see the gable. So the drawing is set now with the excpetion that I'll check some dimensions against the drawings Bob kindly emailed me. I'll begin the build tomorrow which is a little fitting as it also is the start of my summer holiday. Hi, I have made a little progress today. 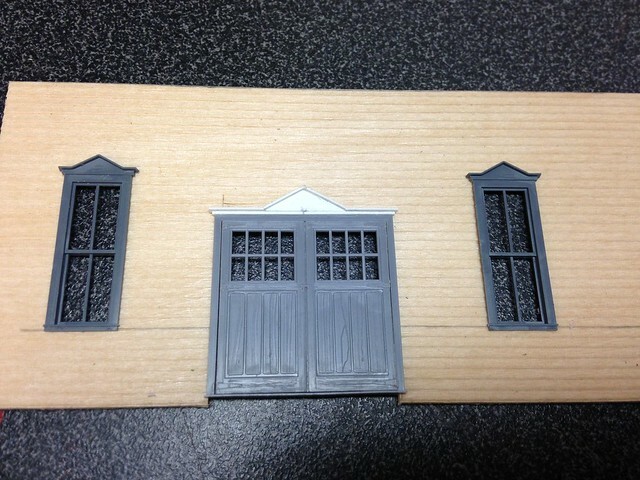 I have cut out the walls and the openings and altered the double doors trim so it corresponds better to the window trim. I have also raised the roof on the tower about 2 scale feet as I realized that the widows walk railing on the main building would not fit below the tower roof. This also made it possible to use the higher windows. I have some thoughts on the paint. I have thoughts on painting the trim white and the siding a light yellow with an accent color on the doors. Like the buildings in the links below. Here are some photos of the progress so far. A tip I got previously on taping the backside when cutting the siding worked great! 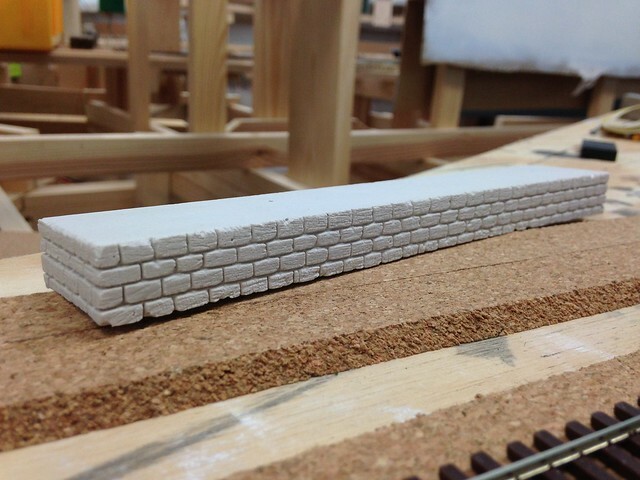 Now comes the difficult question again on the level of weathering on the siding. I have looked at numerous photos of lap siding on the Internet can't on a single one of them see any signs of spike holes. Now the photos are recent with modern paint and perhaps these fill up the spike holes I'm not sure. I still feel this trend with spike holes on the models is a little exaggerated (Please don't hit me ). As the building is about 10-15 years old, I'm only thinking on raising a board here and there and give the paint a little worn look. Let me hit you, with a "High-Five" when it comes to nail holes. I don't like them ether. Except when they're spike heads as in the case of Wharfs and heavy floor boards. Good choice of color. The West and rural area used less colors but yours are fine I think. You are still placing the side on a raised loading dock? Thanks Bob, its leaning toward white trim and light yellow walls with accent color pea green for the doors and parts of the windows. But there is still ample time to decide. Just now I have given the walls a dark wash. 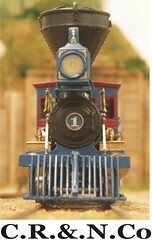 The strategy after it has dried is to dry brush on the light yellow paint (Pollyscales ATSF Catwhisker yellow) and after that has dried abrade away some of the paint to reveal the bare wood beneath. I think on placing the building on a stone foundation which also becomes the foundation for the loading dock. I have just casted the foundation in plaster so I see how it comes out. If it looks strange I go for a wood foundation for the loading dock instead. Hi again, here is a photo of the carved stone foundation. Down in the basement again for some more fun! ... dark wash., ...after it has dried is to dry brush on the light yellow paint .... and after that has dried abrade away some of the paint to reveal the bare wood beneath. 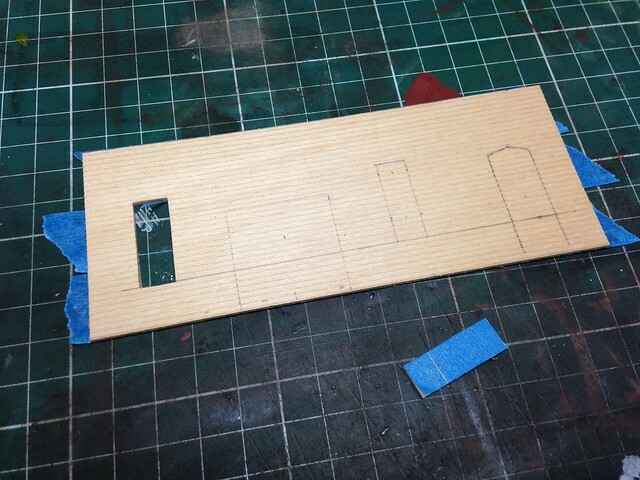 I been following the treads on using this technique on strip wood and was wondering how it would work with scribed wood. So I'm eagar to see your results. Foundation came out nice too! There's one thing about Sunny California right now, my Garage is in the 90's right now. Here is a progress picture showing the painted siding placed on the foundation. The green looks a littler lighter in reality then on the photo as does the yellow. It looks way to fresh right now so some weathering is in order. Tomorrow I'll glue it all together and hopefully if the plaster has dried I will color the foundation. 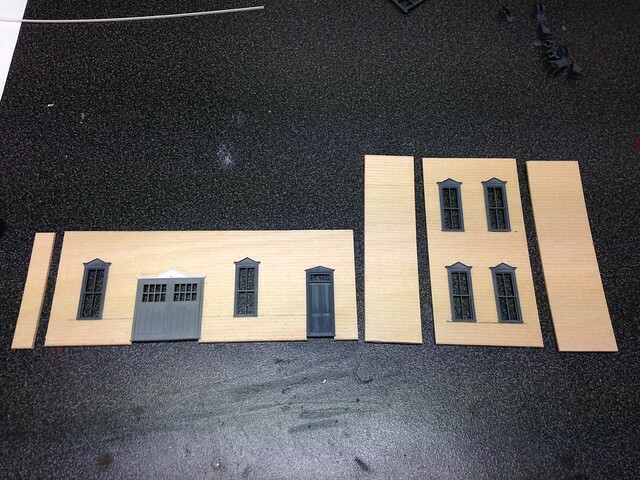 The windows and doors looks a little askew as they are not finally positioned. IMHO, the yellow looks good. But try one window with the green on the window frame and black sashes(which was a very popular combination)and see if you like it. EDIT When I built "my little house on the slough" I did a lot of research into Victorian color schemes. I visited on-line restoration guilds and exchanged Emails with preservation experts. As with anything (in any time) people are involved so nothing is written in stone and there were always eccentrics who followed their own drummers (like early rail modelers, I guess)but in general multiple color Victorians were a city thing and white was rarely used and they used dark colors. In the states the colors lightened as you went West. Everywhere, black or red sashes was in. If I was building my station today the sashes would be black. However in the rural communities Victorians both residence and commercial, were often ALL white. Yes,I know, how boring, every house white and every barn a shade of red, but that is the way it was. I doubt any of us will model it that way though. Or boxcar red/tuscan red on the sashes.